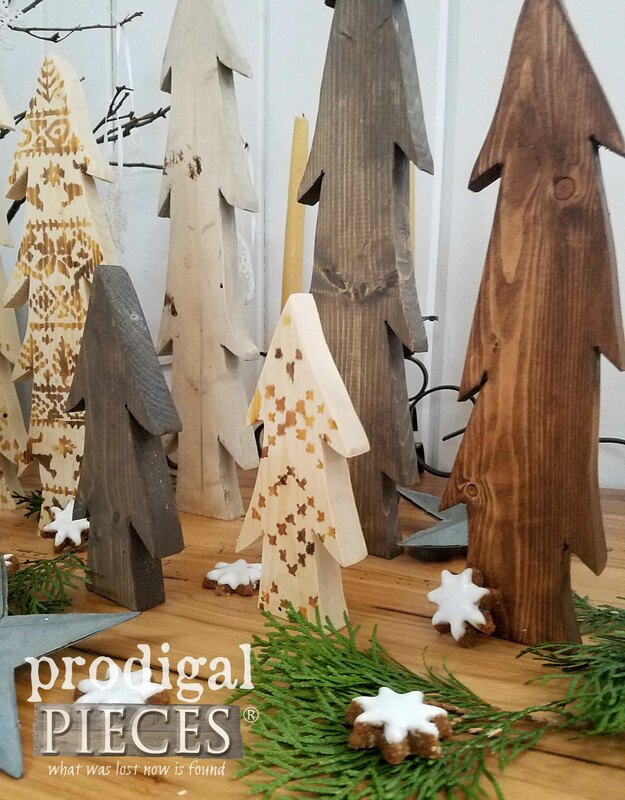 These whimsical trees fit into most any decor whether it’s Nordic, farmhouse, cottage, industrial, even modern. The best part is you can have them look any way you like. I’m just here to get the ball rolling. 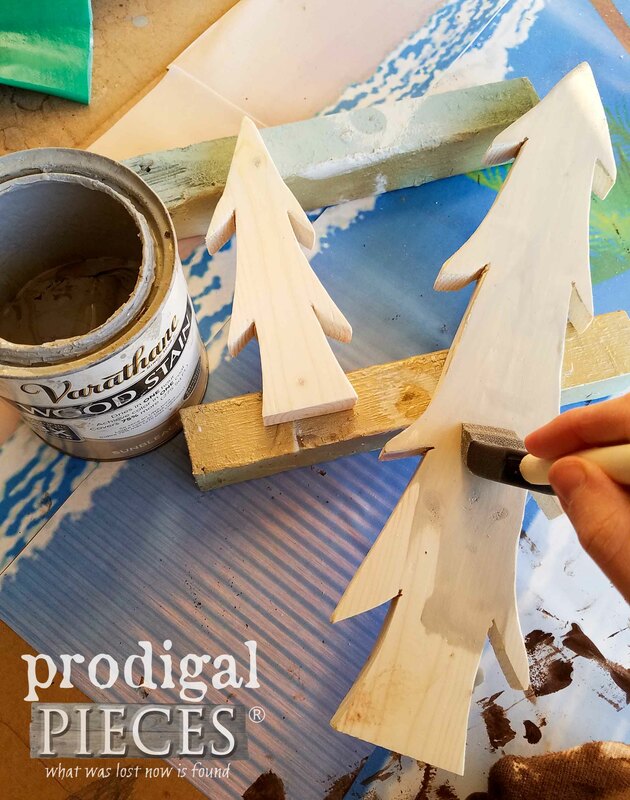 To get started, rough sketch your trees onto your board using a pencil. 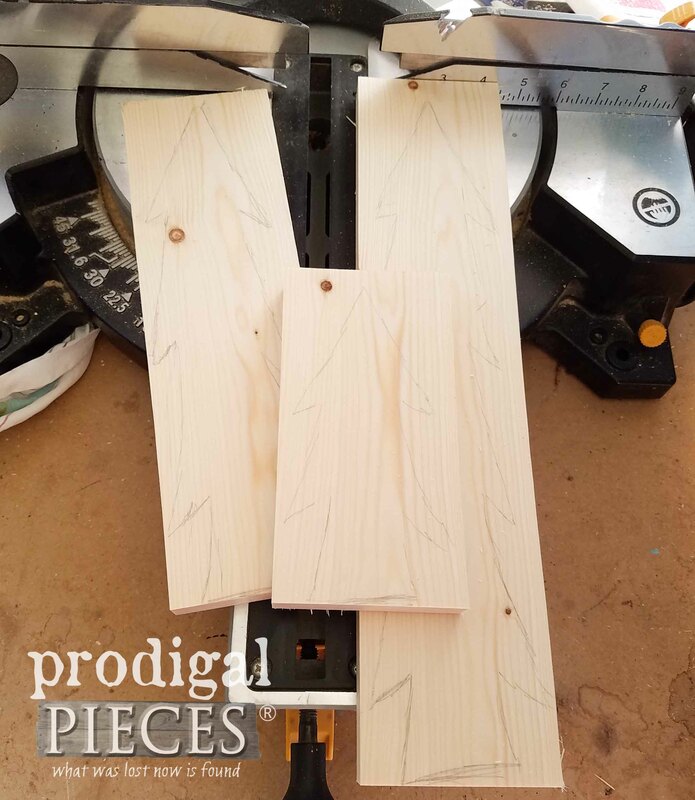 You could cut your pieces to length first, but I like the random height and width. Most of my trees roughly fell into either a 16″, 12 ½”, or 7″ height. There’s no rule to these, just sketch and have fun. Once you’ve got them how you like, cut them to length. I used my miter saw to chop right on the bottom so I got a nice flat surface that the tree can stand on. You could use any saw for this, but this is the easiest way to do it. Now it’s time for some funky saw fun. 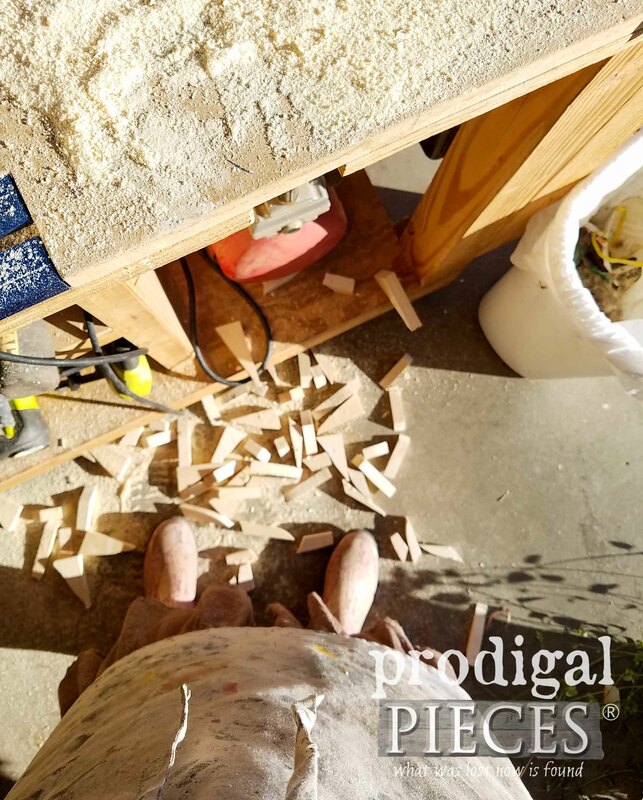 I love my jigsaw and have used it in oodles of projects as seen HERE. One of my other favorite tools is the Kreg Clamp Trak system. It holds my work steadfast, even hanging off the bench like this. You build it to customize your needs. If you don’t have this system, use a clamp and make sure it stays snug. 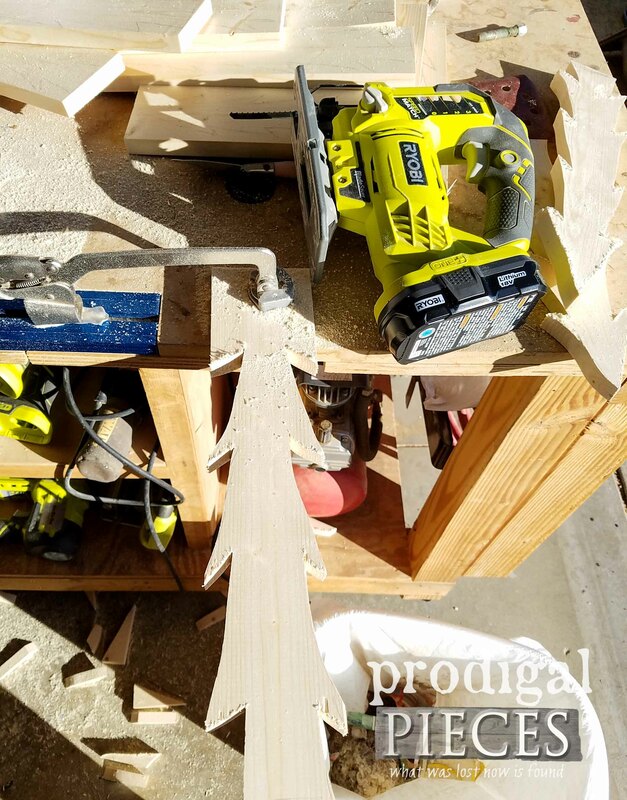 Begin to saw starting from the outside edge working towards the inside corners of your tree branches. It takes two cuts to make each branch stand out. Let me just say I was having a blast making these and got to be out in the sun doing what I love. I feel so blessed! 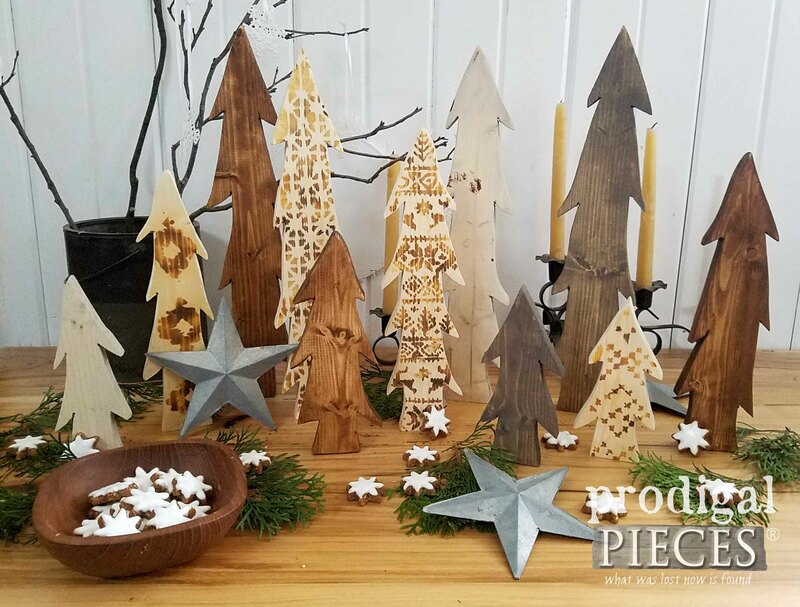 Once you have your Nordic wooden trees cut out, it’s time to sand. I used my favorite orbital sander and a 120 grit to knock down the frayed edges and soften corners. Easy-peasy. 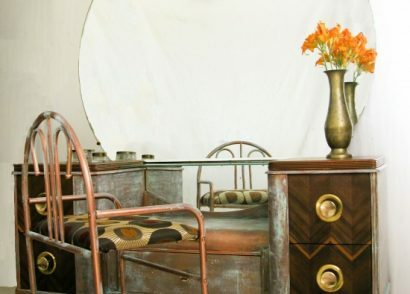 From here it’s up to you how to finish, but if you love what I created, here’s how to get the look. First, I stained my trees in 3 different stains: Sunbleached , Early American , and Briarsmoke . I left a few in the raw for the next steps. 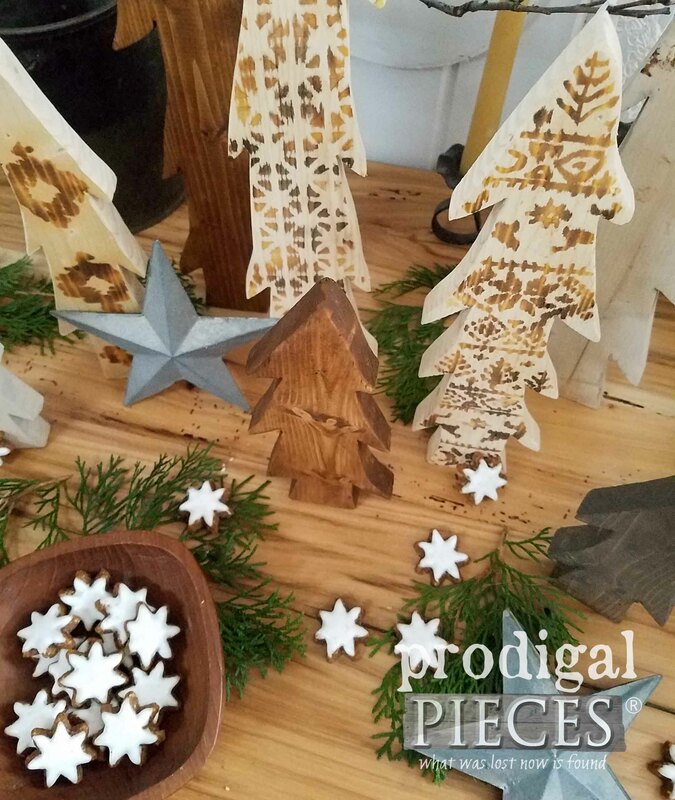 Time to add your designs to your raw wood pieces. 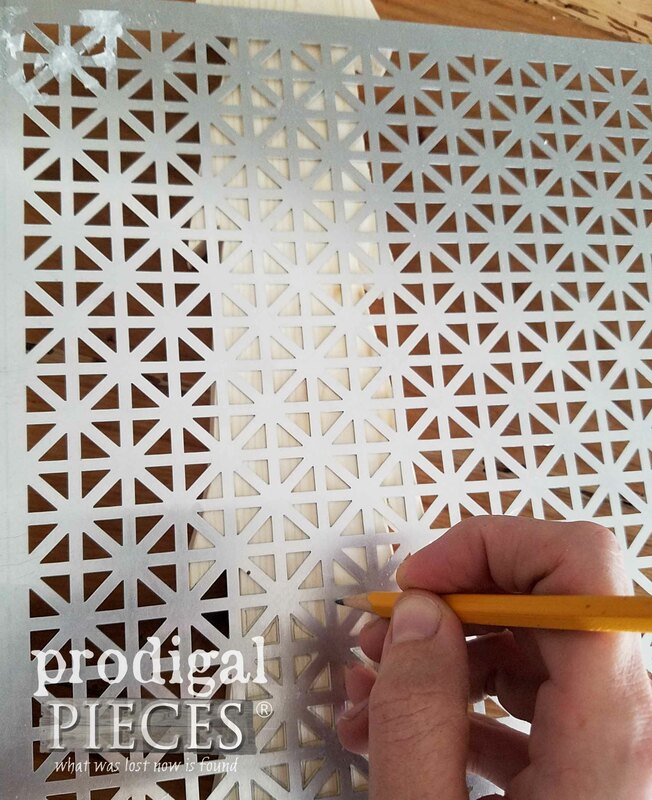 Simply trace a design on using a stencil like this Union Jack aluminum sheet or trace a knit or crochet design. You can find ample sources to replicate on Pinterest. Just be sure to credit the source. Now for the exciting part! 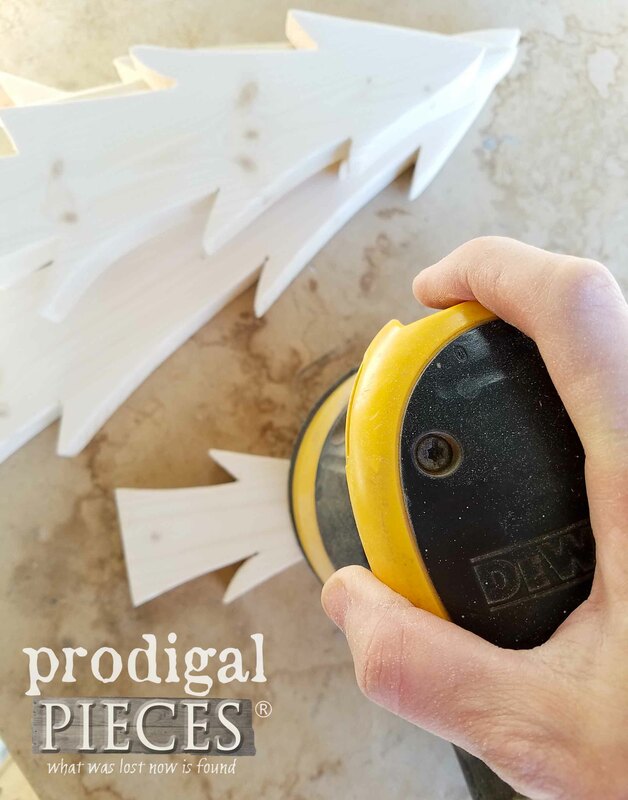 I’ve shown you before how I’ve used my HomeRight heat gun to create many new things (SEE HERE). This time, though instead of using it to take things off, I’m using it to put a design on. 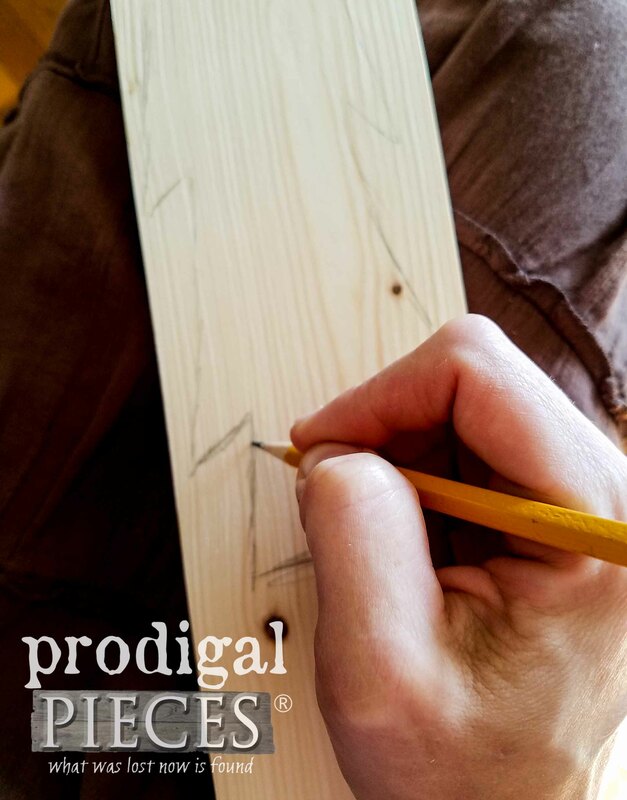 Check this out… by using basic ammonium chloride, you can can design anything you want and wood burn it on. I found this idea by watching a few YouTube videos on the subject and thought I’d have a go at it myself. 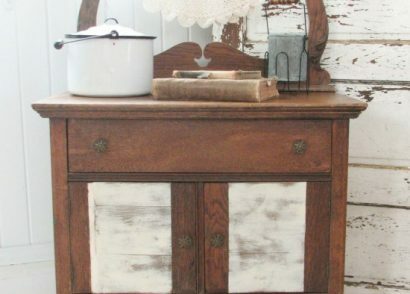 You could use a wood burning tool like I did on this antique desk, but…this is so much faster!! 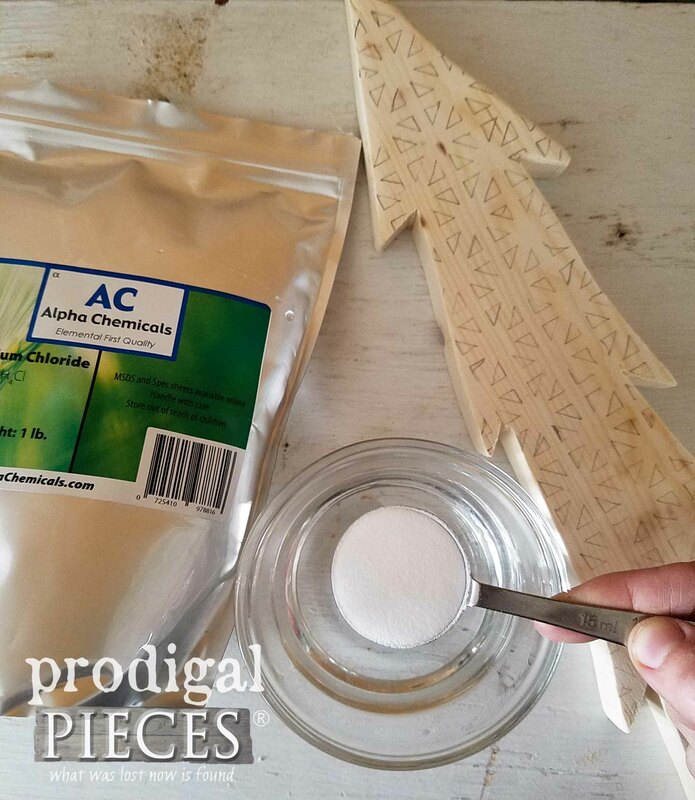 Just mix 1 Tablespoon of ammonium chloride with ½ cup water and stir until dissolved. I tried to look at every local resource in my area to find some ammonium chloride, but ended finding it here on Amazon . You may be able to find it local if you live in a bigger city. It’s is used as a fertilizer, on farm animals, for fish tanks, and to treat people. Brush, stamp, or apply your design in whatever manner you like. I found the designs that didn’t bleed as much were the ones I traced on and made sure to indent into the wood. I didn’t mind the bleeding look as it gave it a more rustic appeal. Let it soak in a bit, but you don’t have to wait too long. Less is more when deciding how much to apply. 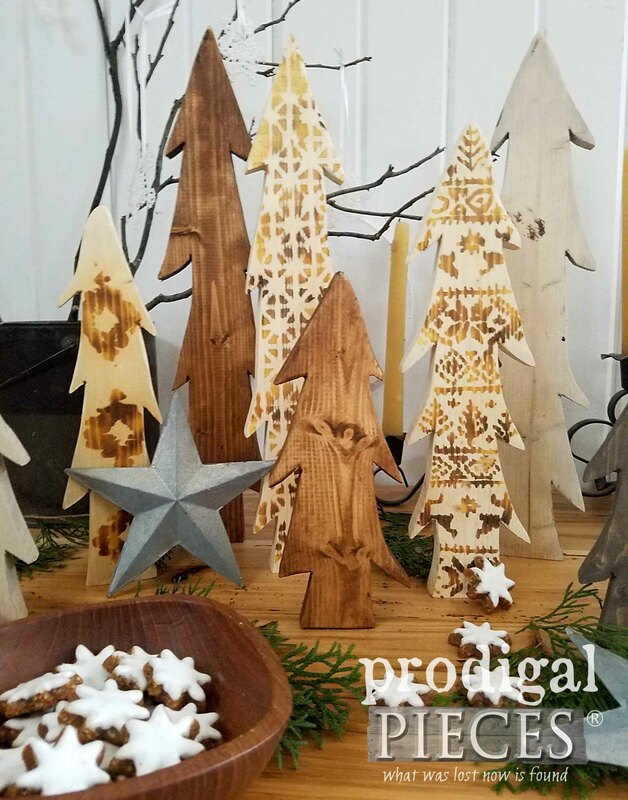 Place your tree or other item to be wood burned on a proper surface to assure you don’t set your counter on fire. ha! 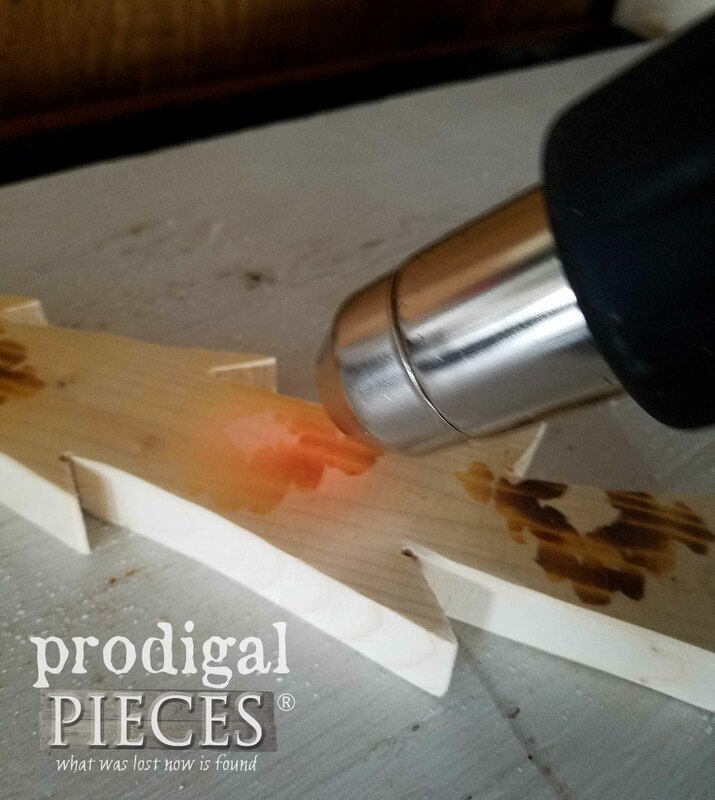 Next, put your heat concentrating tip on your HomeRight heat gun and set to roughly 800 degrees. Let it heat to temperature. I found that holding the gun at slight angle gave it the best effect. Let cool for a bit and you’re done! So cool (or should I say hot) and easy to do. The best part of this is that you can use it for ANYTHING. Fill an empty marker and hand-write your design on, fill an empty stamp pad and stamp away, even use decals, etc. You get the idea. The sky’s the limit! This sure beats the pricey branding irons you have to buy, isn’t it? 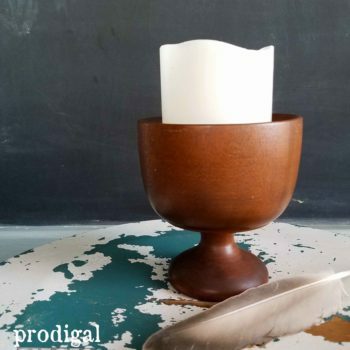 You can bet I have more projects to show you using this technique. 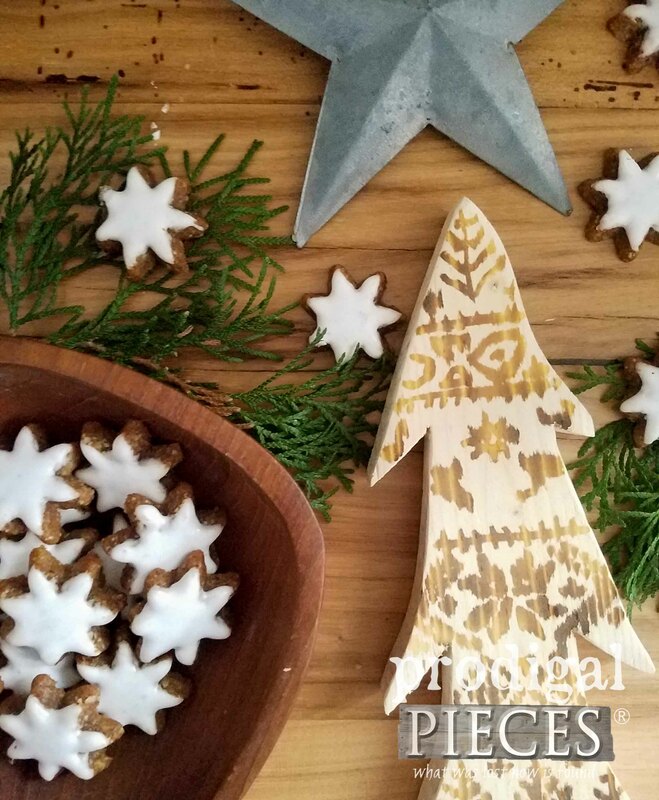 So, I have to ask…what would you create with this heat gun wood burning technique? Easy entry, just fill out the widget below to complete as many entries as you like (daily even). Open to U.S. & Canada residents 18 years of age and older. Winner will be notified via email and will have 24 hours to claim their prize. Be sure to check your spam! 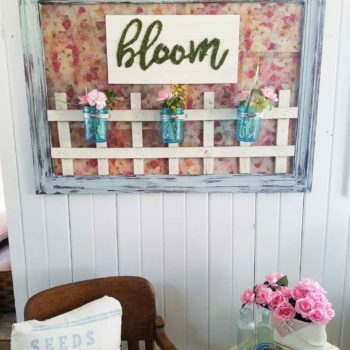 Do pin and share to inspire others to give DIY and new techniques like heat gun wood burning a try! Fun Fun Fun!!! I want to use this to create a sign. I love the little trees. My scrap pile would yield a lot of shapes. This would be fun. It sure is fun to use them up and see them have life anew. I would give it to my husband for Christmas so he could use it on some hand carved wood boxes he is making! There ya go! Sounds like fun. I can’t wait to try out the HomeRight Heat Gun. 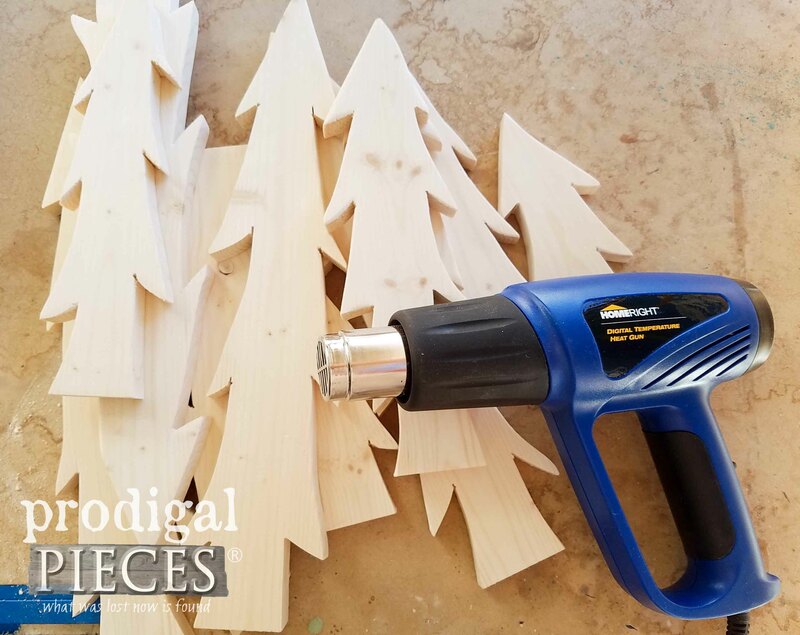 I would like the heat gun for stripping off paint as well as to make wood slice ornaments, signs … Crazy cute idea! Thanks for the inspiration and the giveaway!! I love it for that too. Thanks for the love! With the heat gun, I would probably try to remove layers of paint off a bookshelf. It works wonders for that. Honestly I am not sure, but know I would put it to good use. This is so cool. I’ve never seen this technique. Now you’ve got me wanting to make a whole forest! Wahoo!! That made me giggle – thanks! Your projects are cool. 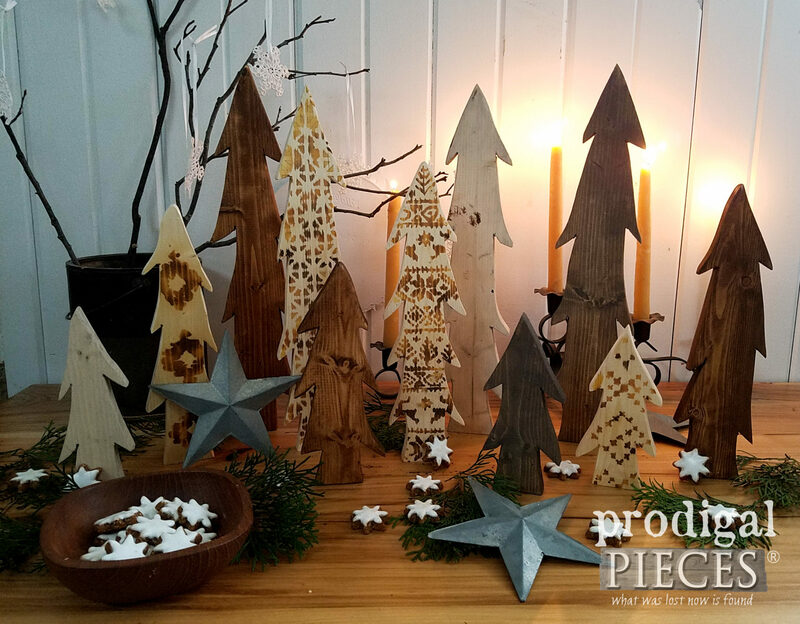 I would love to make some Christmas decorations. I am not that creative haha! But I would probably attempt to make some cool decor for around the house. You amaze me as always! I have an unfinished IKEA dresser that would be so cool with an Aztec or Nordic design! Would love to win the heat gun, thanks for the giveaway. I would try the trees and also some rustics sings. 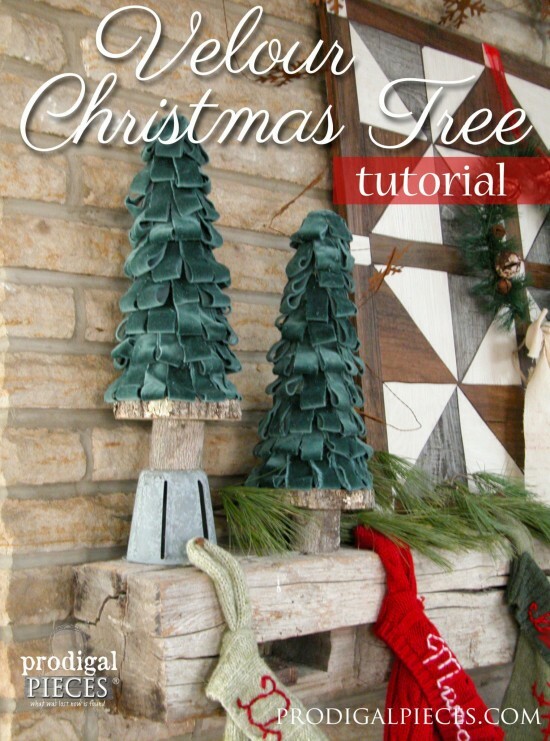 I would love to make these trees. Thanks for sharing your ideas. So Cute! I would love to try using a heat gun, it would be a new experience for me! Congrats on winning Zibra’s storage box and paint brush challenge! Hippies Rule! Congrats on you win! I voted for you. Great job! Such cute trees ! Heat guns are soooo useful. Congratulations on your win !!!!!!!! I voted for you, too, and felt you would definitely be the winner ! I would warm my cold feet when did I get old??? I’ve never seen this technique! So clever! I’d love to win this to use as a stripper then to also try this technique. My mind is reeling at the possibilities! I can’t wait to do more. I’m not sure what my first project might be, but it might just have to be those cute little trees. Sure! They’re fun and easy too. Yay! Ok, so this is definitive proof that you can teach an old dog new tricks! 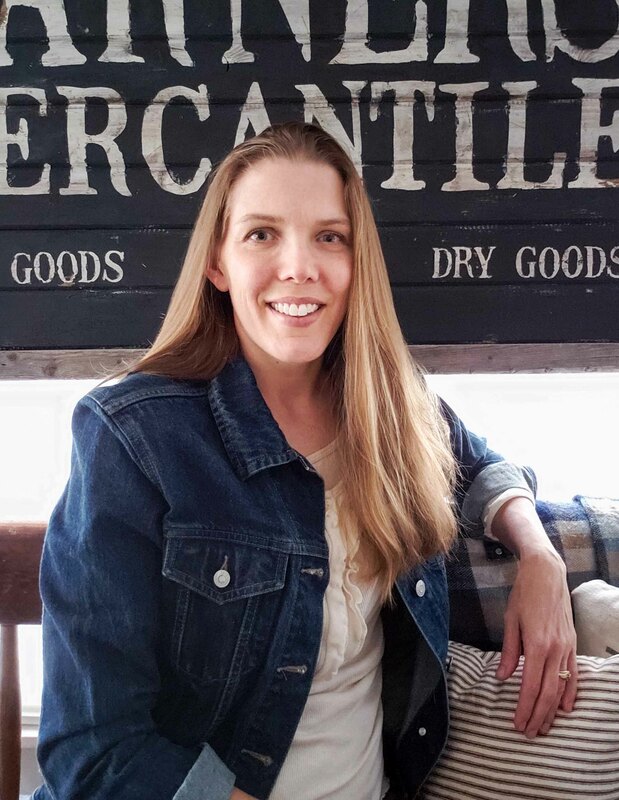 I have learned so much from your blogs! Now to just remember them all and put them in to action and get crafting! You are hilarious, Deirdre!! You’ve made my day. Hugs!! I love this. I have never seen this techniques. So much easier than the traditional method. I have sever ammo boxes I would love to try this on. Yes! 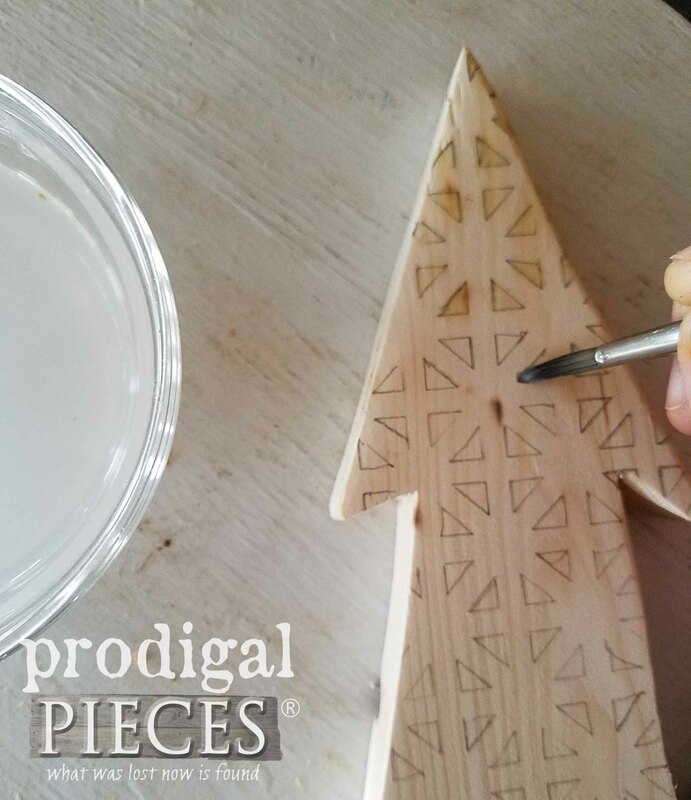 I love my woodburning tool for many reasons, but this one allows me to do larger projects faster. Yay! I love this idea. 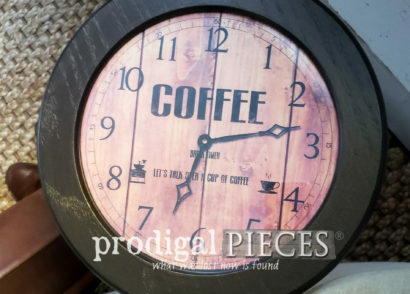 It would be cool on wood slices for coasters or ornaments. Yes, I think so too…and cutting boards, furniture, walls, yummy!! Great job. I would make some signs with the heat gun. I don’t know what I would do first but the possibilities are endless! You got that right. So fun! So I love this idea! 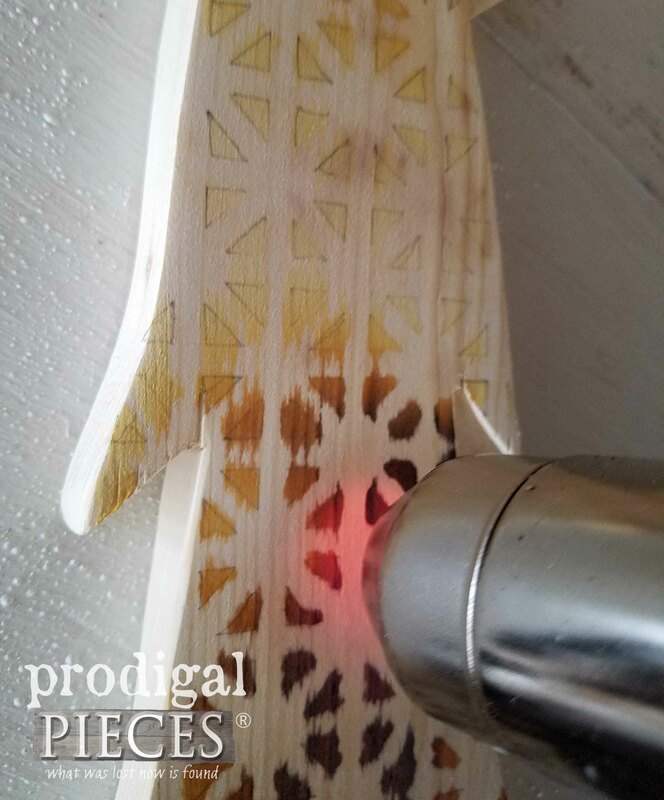 I’ve never ever thought of using a heat gun for wood burning! I have a ton of ideas swirling now but first off I would use it to help make a wooden LSU family tree wall hanging for my family. Ooh…that would be so fun! 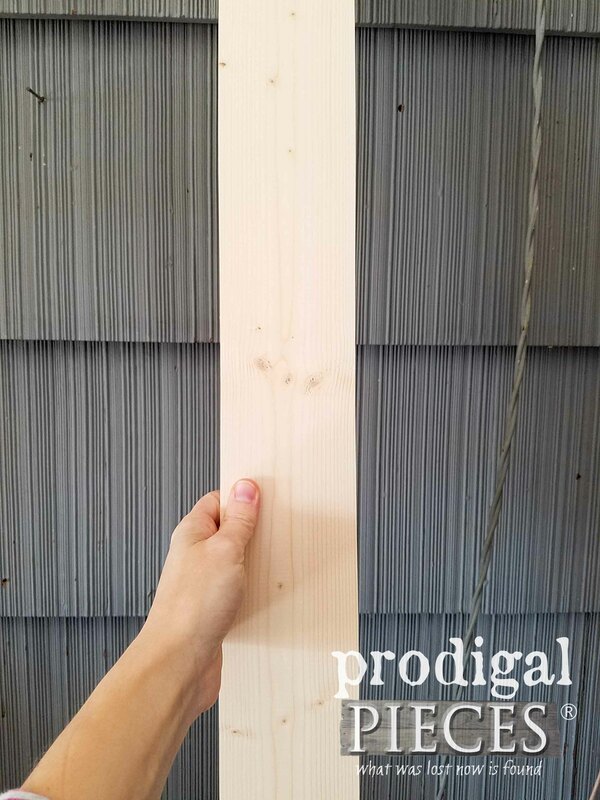 I would love to make one of the wooden rulers that you use to measure your child’s growth. That’s a fantastic idea!! I made a growth chart years ago and painted it to look like a sunflower with little kids hanging off. My kids love it!